The Cowichan Intercultural Society is proud to announce that our Compassionate Leaders Project received the Canadian Race Relations Foundation (CRRF) National Award of Excellence in the youth category. As the winner, the Compassionate Leaders Project is recognized for “building an awareness and understanding of Canadian values and identity that are reflective of Canadian diversity” (CCRF). 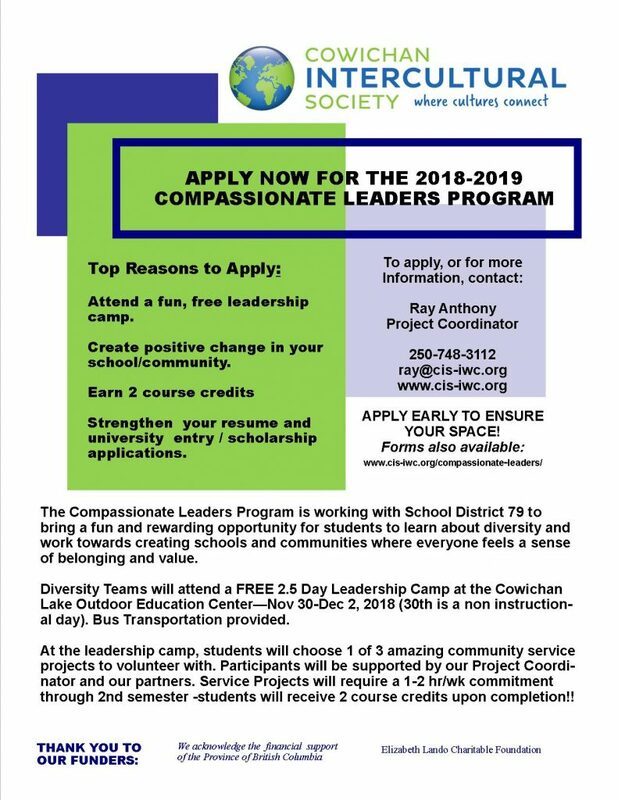 2016-2017 marked the fourth consecutive year that we have partnered with SD79 to deliver the Compassionate Leaders Project (CLP). Participants from all five secondary schools were represented at the leadership camp and successfully completed their action plans and team projects. The direct project participants accumulated over 1,100 hours of voluntary service hours during the year. We ran our leadership camp from December 2 – 4, 2016. The camp workshops and activities were focused on building self-awareness, teamwork, anti-discrimination first aid, compassionate communication, exploring social justice issues and action planning. On the last day, participants formed into school-based action teams and began working on conceptual action plans and team projects. For the past two years, one of the teams organized the Cowichan Valley Youth Action Day – This annual event celebrates Cowichan Region’s youth who are engaged in community service as well as in motivating and inspiring other youth to get involved. Four CLP participants decided to take Youth Action Day 2017 on as their team project. The team worked very hard over four months on planning, fundraising and organizing the event. They helped to recruit youth and young adult speakers on topics that mattered most to them (LBGQT+, Substance Abuse, Mental Health and Volunteerism). In addition to the speakers, the event was again emceed by Jon Williams (DJ from 91.3 The Zone FM) and featured musical guests Carmanah and the Deep Sea Gypsies. Frances Kelsey Secondary successfully organized a school event, Arts for Awareness. The theme of the event focused on raising awareness about different forms of abuse and promoting more healthy and respectful relationships. Chemainus Secondary action planning team attended “Train the Trainer” workshops to learn how to facilitate the Safe Harbour Youth Ambassador Program at local elementary schools. They visited two grade six classes at Crofton and Chemainus Elementary Schools and co-facilitated half-day workshops that focused on diversity and inclusion. Lake Cowichan Secondary team saw a unique opportunity at their school to practice their new leadership skills by starting a weekly lunch drop-in program for elementary students (Grades 4-7) that are at their school. Cowichan Secondary School team was most concerned about youth and homelessness in their community. The team decided to work with the community’s Meals on the Ground program and planned, prepared and served a four-course dinner to 50 homeless and underprivileged community members.